​For Tabletop Co-Op this month, we are headed back to the mega-popular world of Magic: the Gathering. Magic is one of the most competitive head to head experiences gaming has to offer, but there are some homebrew variants that offer cooperative play. We covered one such fan created variant, Horde Magic, last year. 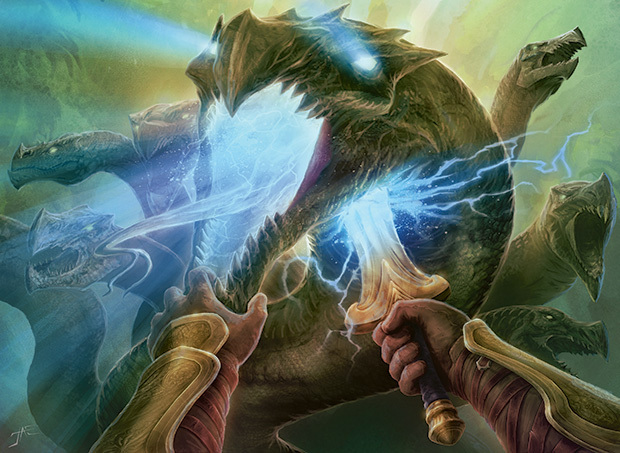 Recently, Wizards of the Coast released the "Face the Hydra" Challenge Deck, giving card slingers the first official cooperative gameplay in Magic’s history. The current Magic set, Theros, draws inspiration from Greek mythology and legend. The three pillars of the design are gods, heroes, and monsters. Magic Game Days, special events which tie in to the release of new sets, have been thematically tied to the trials of the hero. Think Hercules’ labors or Perseus’ trials. 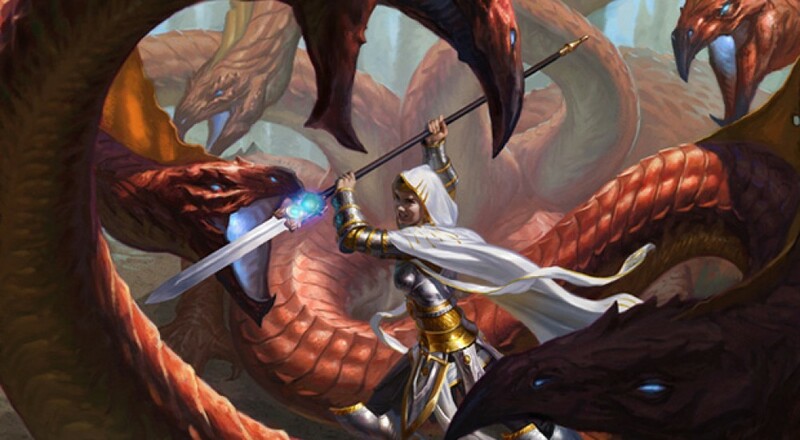 The challenge Magic players were to face at Theros Game Day was playing against the Hydra Challenge Deck. The Hydra Deck uses many of the same mechanics as Horde Magic. It is composed of a mixture of heads and sorceries. Heads function like creatures, though they cannot attack. 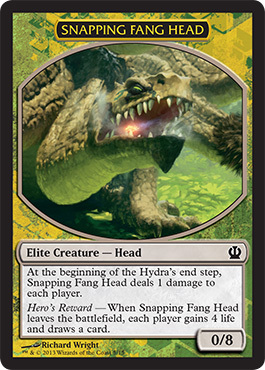 The sorceries in the Hydra deck have various effects, like making heads indestructible, damaging players directly, or even spawning new heads. On the Hydra’s turn, players turn one card over. If it is a head, it goes directly onto the battlefield. If it is a sorcery, players have the chance to counter it, then it resolves. At the end of the Hydra’s turn, each head deals damage to the players. Normal heads deal one damage, while elite heads deal two. You can choose to begin with between two and four heads in play, depending on the level of challenge you want. Players work together to take down the Hydra. Just as in the Archenemy variant, players take a simultaneous turn. Creatures can attack heads directly, or spells can be cast on them. Normal heads have only three toughness, but elite heads can have six or eight. Small rewards, like precious life points or valuable card draws, are given when heads die. 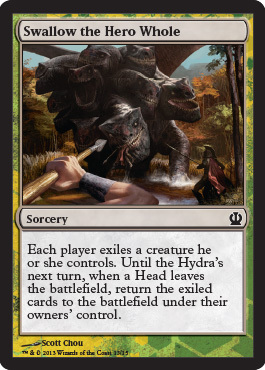 That’s the good news, but the bads news is, if a head dies, two cards must be turned over from the top of the Hydra deck. Any heads are put directly in play, while sorceries are discarded with no effect. Play continues until there are no heads in play, or all players take lethal damage. Facing the Hydra deck is a very tense experience. From the start, there is a tremendous amount of pressure. It’s not uncommon to be down to almost half your life point total by the end of the hydra’s second or third turn. Mounting a quick offense is key to survival. However, if you and your friends manage to last until the mid to late game, the rewards from killing hydra heads stack up to give you a serious advantage. But even when it looks like the battle is won, and you strike down the last head, two more can spawn, often followed by a third on the Hydra’s next turn. The Hydra deck is a worthy opponent, by any measure. That’s not to say that the Hydra Deck is perfect, though. The biggest problem is that the difficulty doesn’t scale well when extra players are added. It is easier to take down the hydra when you are paired with one friend. If you add in another buddy or two, the Hydra Deck challenge isn’t really a challenge at all. The only support for tweaking difficulty in the official rules is the number of heads that start in play, ranging from two to four. Even with four heads, four players will win almost every time. House rules to increase difficulty can be used, such as tweaking the number of cards the Hydra deck draws each turn, or allowing sorceries drawn when a head dies to resolve. Still, an official dial to adjust for increased challenge would have been a nice inclusion. There are a whole host of ways in which players can cooperate with one another to defeat the Hydra. You and a friend can send your creatures to attack heads together, taking one down when you couldn’t do so alone. You can buff your teammates’ attackers with enchantments, or play combat-affecting instants or sorceries to make their armies more deadly. We even had a situation where a teammate used a spell that cost life points, knowing they would die to the hydra, but the rest of the team went on to win. It’s very refreshing to be able to play Magic cooperatively, since the game can be downright mean when played head to head. The "Face the Hydra" Challenge Deck is a great way to play Magic with a few friends. The rules are simple, but the Hydra can be a difficult opponent. By adjusting the amount of starting heads for the Hydra, as well as a few other house rules, you can make the challenge as easy or difficult as you like. Plus, the Hydra Deck is very flavorful, making players really feel like a team of heroes working together to defeat a horrific monster. Best of all, you can pick the Hydra Deck up at your local game store, or online, for a very reasonable price, at least for the moment. If you are a Magic fan, but want a more casual, cooperative experience, pick the Hydra Deck up and give it a try. Page created in 0.8158 seconds.